The newly designed CT89 temperature recorder with remote sensor employs advanced microcontroller design that enables this versatile instrument to accurately measure and record temperatures in air, gas, liquids, powders, solids, and semi-solids. 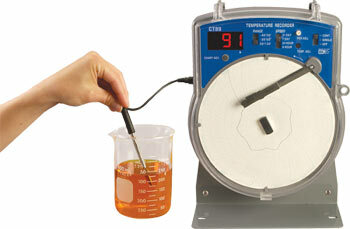 The CT89 is a precision instrument used to monitor and record temperature on 6" circular chart paper. It may be carried as a portable instrument or mounted in a fixed location. A combination of 3 temperature ranges and 4 chart speeds provide a high degree of flexibility. In addition, the chart rotation may be set for single or continuous turn operation. To protect the data being recorded the CT89 uses an automatic battery backup to maintain operation during a power outage. Nota: Comes complete with 60 assorted 152mm (6") diameter charts, 102mm (4") probe, 2 black cartridge pens, and operator's manual.